Lam proposes to extend statutory maternity leave from the existing 10 weeks to 14 weeks. The current ML pay rate, four-fifths of the employee’s average daily wages, will also be applied to the additional four weeks pay. The cap is HK$36,822 which is the four weeks ML pay of employees with a monthly wage of HK$50,000. The cost of this extra ML pay will be reimbursed to the employer by the government. The offsetting arrangement of severance payment (SP) and long service payment (LSP) with employers’ mandatory contributions under the MPF System will be rescinded two years after the legislative council and the government are in accord. The government will placate the employers with a two-tier subsidy under which the second-tier subsidy period will be substantially extended from the originally proposed 12 years to 25 years. 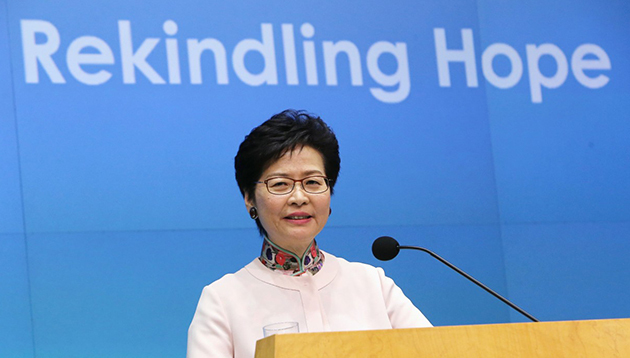 There is an approximate HK$12.1 billion surge from the government’s preliminary total financial commitment. Lam’s government will assist employers in setting up designated saving accounts (DSAs) under their own name to prepare in advance for their potential SP or LSP expenses in the future. Employers will contribute 1% of their employees’ monthly relevant income to their DSAs until reaching 15% of the annual relevant income of all their employees. Establish two research clusters at the Hong Kong Science Park on healthcare technologies and artificial intelligence/robotics technologies. Allocate HK$2 billion for launching a “reindustrialisation funding scheme”. Inject $20 billion into the Research Endowment Fund of the Research Grants Council; launch a $3 billion Research Matching Grant Scheme; and introduce fellowship schemes for outstanding academics in Hong Kong. Lam will continue to urge the legislative council to pass the bill of increasing statutory paternity leave from the current three days to five days. It was introduced in late June this year in the Employment (Amendment) Bill 2018. Titled “Striving ahead, rekindling hope”, this policy address sets out the framework on the Lantau reclamation plan, national security law, e-cigarettes prohibition, housing schemes, and many more. Heading overseas for work? Or perhaps meeting an extremely important client here in Singapore? Here’s your official etiquette guid..